Here you can find the complete list of the discounted products, all new and with 2-year warranty. 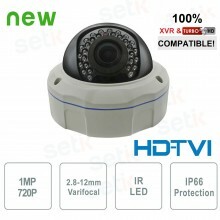 HD-TVI Dome Camera with 720P Resolution and 2.8-12mm Varifocal Lens. Image Sensor: 1/3” 1.0 Megapixel Aptina Cmos 239 + DSP 8060; 25/30fps@720p. IR Illuminator with 36 leds. Day/Night(ICR), AWB, AGC, BLC, 3D-DNR, IP66 Protection. 12V DC Power Supply not included. High Quality. DVR surveillance video recorder Hybrid AHD / IP / ANALOG. 4 Channels @1080p, FULL HD Full Real time (25fps). 4 Channels IN/ 1 OUT, Supports Max 1 HDD; 2 USB ports. Supports AHD-H encoding; Supports wifi and 3g keys RS485 port. Super Gift: 500GB Refurbished Hard Drive! How to take advantage of the promotion? You will only have to add the discounted products that you want inside your shopping cart and conclude the purchase! The promotion is valid until stocks last!